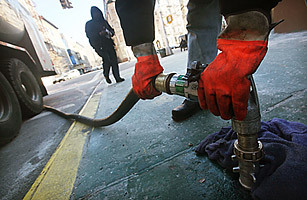 Heating oil is delivered to a building in Harlem January 12, 2010 in New York City. To most people, the Big Apple seems anything but green. Take a look at the skyline and you will probably see black smoke billowing out of at least one of New York City's many skyscrapers. Environmental expert David Owen wrote in his 2009 book Green Metropolis, "Most Americans, including most New Yorkers, think of New York City as an ecological nightmare, a wasteland of concrete and garbage and diesel fumes and traffic jams." In reality, New York is far more environmentally friendly than most think. In fact, if every American lived in New York, the U.S. would be a world leader on the climate front, instead of a laggard. Why? Efficiency. Nearly 71,000 people live in every square mile of Manhattan alone. That means people live in smaller homes and travel shorter distances, often by walking, biking or public transit. The result: New York's carbon emissions are less than a third of the per capita national average. Now New York is doing something about that black smoke as well. Last month, on Earth Day, Mayor Michael Bloomberg updated a plan to cut as much as 85% of the city's soot emissions. The culprit: Heavy heating oils. Emissions from the 10,000 or so buildings that still burn heating oil, most of them older apartment buildings, account for the vast majority of the city's soot  more than is created by New York's cars and trucks combined. The rules will ban the worst heating oils by 2030, to be replaced chiefly with cleaner natural gas. "By the time today's new rules are fully implemented, we expect that they will save something like 1,500 New Yorkers' lives each year and improve the quality of life for thousands more," Bloomberg said. Ironically, the reason for New York's abundance of air, and water, pollutants is the same reason the city is so green: Density. That density, while making transportation and energy use far more efficient than it is in more spread  out cities or the suburbs, also concentrates certain environmental ills. Put all those people in such a small area  creating waste and burning fossil fuels for power  and you can get intense water and air pollution. Density is one of the reasons the rivers surrounding New York were so polluted that swimming was hazardous for years, and why the city still has some of the highest childhood asthma rates in the country. And that pollution is also one of the reasons many New Yorkers  especially those with young children  eventually choose to flee the city for the cleaner, if far more wasteful suburbs. Density is great on a collective basis, but it's not always so great if you or children have to live in it. The new plan to cut harmful emissions, which was put together with the help of green groups including the Environmental Defense Fund (EDF), is overdue. Switching over to lighter heating oils and eventually natural gas doesn't require a technological leap, just some motivation for the city's property owners. At a press conference announcing the new policy, EDF president Fred Krupp held up a jar of No. 6 heating oil, the most polluting type in use. The oil inside the jar was thick and viscous  essentially, unrefined sludge. It's also cheap, which is why it's still burnt. No. 6, along with the slightly lighter No. 4 heating oil, will be phased out over time. No. 6 will be gone by 2015; No. 4, by 2030. All new boilers installed from now on will need to use either natural gas or the cleanest heating oil, No. 2. The fall in natural gas prices  in part due to the increase in production from shale gas deposits in nearby Pennsylvania  will help cushion the transition. But, as part of the plan, NYC will also spend as much as $36 million in federal funds to help small building owners improve their energy efficiency and cut harmful emissions. The city's own buildings will have to comply as well  more than 200 public schools are targeted for the switch. The transition won't be free  it costs about $10,000 to convert existing boilers to burning No. 2 heating oil, and considerably more to switch to natural gas, and property owners have warned that the change could lead to higher rents or maintenance payments for apartment dwellers. But the benefits can't be ignored. A 5% reduction in the concentration of fine particles in the city's air is enough to save an estimated 1,500 lives over the next two decades. "We're going to see the end of black smoke belching from New York City apartment buildings," Krupp said at the announcement. "This is the single biggest step New York City can take to make its air cleaner and healthier." That public health benefit will be as obvious as it is necessary. After all, the old buildings that burn the most polluting heating oil tend to be concentrated in parts of New York, like the South Bronx, that already suffer from high rates of respiratory disease. Overall, air pollution already contributes to 6% of the deaths in the city each year. But that's not the only reason to clean up air pollution. As New York addresses the environmental problems that come with extreme density  including through something as simple as putting a park within a 10minute walk of every New Yorker, another of Bloomberg's goals  the city becomes a better place to live. And that in turn benefits the climate as a whole, by drawing people away from the inefficient suburbs and into the city, where their carbon footprint will shrink by necessity. As the global population becomes increasingly urban  more than 50% of the world now lives in cities  the future of the environment and the climate will ultimately depend on how those urban areas are run. The single greenest action mayors can do is to make their cities more attractive places to live  and the best place to start is by cleaning up the air that we breathe. See a video on why cities are key to American success.